PsychCentral recently published an article featuring an interview with me about how to bring more joy to our days. In it, you'll find 9 tips--including some that might surprise you--on how to cultivate joy everyday. I was recently interviewed for an article on Parenting.com about what to do when your child says, "I like Mommy (or Daddy) better!" 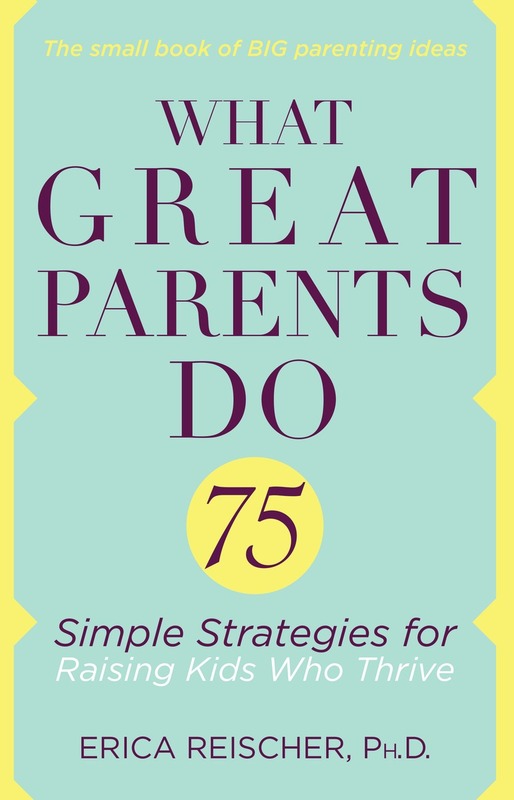 Whether you're the preferred parent or the one feeling rejected, these five tips can help you get your parent/kid dynamic back on track. I'm delighted that the Washington Post published an essay of mine this week. But the editors changed the title, and that's had an interesting effect. Originally called "What's Wrong with Having Average Kids?" the essay is a commentary on our achievement oriented culture, and why adults must be careful about how we talk to kids about goals and their future. But the new title picked by the editors ("No, Honey, You Can't Be Anything You Want. And That's Okay"), along with the image and caption (a girl dreaming of being an astronaut), seems that it might prime readers to view the essay as suggesting that parents not encourage their children to push limits or dream big--which is emphatically not my message. I'll be curious to hear how it reads to you. Read it on the Washington Post site. Earlier this week, I was featured on KQED Public Radio 88.5 FM (our local NPR affiliate) as part of their Perspectives program. The topic was parenting and economic anxiety. If you have kids, you probably spend a lot of time thinking about their future, trying to decide when to push them to try harder and when to back off. We read about Tiger Moms who send their kids to Harvard or Carnegie Hall, and we might think, "Should I have done more? We also hear about the sometimes tragic effects of parents' efforts to launch their children toward success and we think, "Thank goodness that's not my family." As a mother myself, and as a psychologist who specializes in families, I am deeply familiar with these questions. But when we think about the problem in this individualistic way - how best to provide for my child - we ignore larger socioeconomic and political circumstances that make families insecure and push the drive to succeed into overdrive. As a psychologist and parent coach, I work with many people who feel stuck in some part of their lives: stuck in an unsatisfying job or relationship they feel they can't change, stuck in a cycle of anger and yelling (often followed by guilt), stuck in a pattern of misunderstanding and emotional distancing, and so on. In most cases, the people that I work with already know what their "stuck" issue is and they have often read books or sought guidance in the hopes of resolving it. But they still feel stuck. Why? Often, the reason we continue to feel stuck lies in the difference between knowing and doing. Reading a book and acting on it are not the same thing. Having an idea and putting that idea into practice are not the same. The difference between knowing and doing is a critical one. While we generally cannot “do” without first knowing how, if we know but do not act on what we know, then change will not happen. I was interviewed by the folks at Yahoo Parenting about what to do when someone--friends, family, or even strangers--offers you parenting advice. From Yahoo Parenting: "Every parent’s been there: Your baby is crying, and the cashier at Target says it’s time for a feeding. You change a diaper in front of your mother-in-law, she immediately offers up her “better, faster” method. Your boss overhears you complaining about how your toddler will only eat mac and cheese, he butts in with his no-fail strategy for raising a veggie-lover. Only problem? You never asked for their input." You can read the full article here. The clever folks at Yahoo Parenting also created this very useful flowchart ("How to Deal with Unsolicited Advice") summarizing the key points from their interview with me. The flowchart will give you examples of what to do and say, depending on your relationship with the person. Enjoy! As a working mother, I'm always on the lookout for simple things I can do to make life easier and more fulfilling. Whether it’s learning that I can use a microwave to disinfect a kitchen sponge in one minute or apply baking soda to remove water stains from wood furniture, I love to find tips and tricks that save time, reduce stress, and make a small but meaningful difference in my life. These sorts of simple tips and tricks have come to be known as “hacks.” There are life hacks, cooking hacks, decorating hacks, cleaning hacks, and so on. With that in mind, here is my contribution: 5 parenting hacks from a developmental psychologist who specializes in parent-child relationships (but who is not a very good cook). They all take less than 1 minute to do, but have powerful and often immediate results.